I am almost speechless as I look through these images. Sometime I feel overwhelmed with excitement, I feel a little disbelief, all because the images I am about to show you are my little brother! The little guy that I taught how to pick out his clothes for school so he would look good, the little brother that grew up with two older sisters telling him what to do, and the little brother that I have been praying would find the right girl to be his wife. Ahhh, how time flies sometime! Moments do happen in the midst of our busy lives that allow us to slow down and enjoy the things that are happening; to be present. 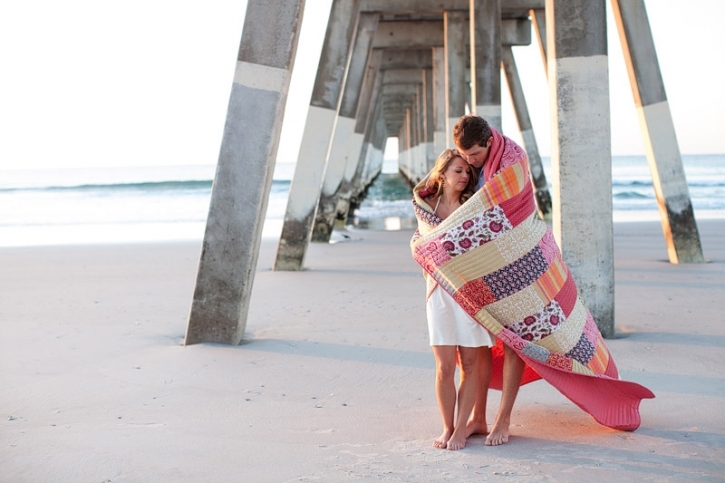 A few weekends ago, on the perfect morning at Wrightsville Beach I had one of those moments. The perfect sunrise, glassy water, no foot prints had touched the sand. I will let you all in on a secret. The night before the session my brother stayed up late to finish restoring Bethany’s bike! He broke the whole thing down and rebuilt it all week. He wanted to surprise her, and to use it during our second half of the engagement session! We took to the streets on beach cruisers, and had a great time scouting fun spots to shoot next. I love the playful-side of these images! I love the LOVE that is shown in all of these images. How close they are, and how sweet the season before you get married is in life. Thank you Donnie and Bethany for sharing this morning with us. It will always be a special memory for us, and we are so excited to stand with you on your wedding day! You have so many fun days ahead, and I hope that when things get hard, that you will share a sunrise together and remember how special it is to be in love. Donnie - Thank you both for waking up with us super early to get these shots. Bethany and I both are excited about how everything turned out. Great weather, great photographers, great time! Beth Raulerson - amazing pictures. what an awesome memory for all involved, i’m sure. Pam Watkins - Alana,You are right.You can see and feel the luv in these pictures.Awesome pictures and awesome photographer.Thank-You so much! Susannah - Beautiful pictures, my friend!! What a sweet sweet couple!